Around July every year, Laxman Nag, a resident of Kolang village on the outskirts of Kanger National Park in Chhattisgarh, sees crows in his dreams. He sees the birds attacking silk cocoons to pick the larvae inside and wakes up in a sweat. Cocoons in the wild are his main source of income and the season for collecting them are August and September. “If crows ruin the cocoons, my income halves,” said Nag who earns around Rs 10,000 from about 5,000 cocoons he collects each season. Nag’s village is in Jagdalpur district of the Bastar region. He sells the cocoons in the weekly market in the nearby Darbha village from where traders pick them and sell them to buyers in Bihar and Karnataka. Like Nag, 250 residents of his village are dependent on forests. Every season, they collect a different produce (see ‘MFP sustains 275 million’). The average family income in seven villages around Darbha is Rs 15,000 a year. They trade in 50 MFP items, including tendu leaves and kullu gum. Kolang is one of the 12,000 villages in Chhattisgarh with access to forests; 44.2 per cent of the state is under forest cover. About 70 per cent of people’s income in these villages is from MFP. The threats to the people’s income are many—crows, extreme rain and heat, pest attacks, forest guards and Maoists. This year, fluctuations in the international market hit MFP trade. Demand for sal seeds in Europe decreased due to recession (oil from the seeds is used in processed foods). Its impact was severe. Jhinki Nag, a tendu collector of Kamanar village in Jagdalpur said she used to earn about Rs 10,000 from tendu leaves and sal seeds each year which was enough for her and her two children. This year she earned only Rs 5,000 as she did not collect sal seeds; the government slashed procurement price from Rs 10 to Rs 5 per kg. “The government price is too low,” said Nag who plans to migrate to city. 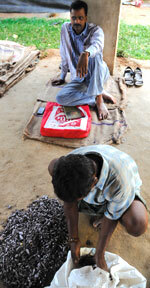 In neighbouring Jharkhand, annual income from MFP in villages comprise 10 to 31 per cent of a family’s income. Here Naxalites are hampering people’s access to forests. “In the last five years, I have limited my forest produce collection to just one hour a day. My income has reduced 70 per cent,” said Lorenz Sia Tirkey of Loki Village in Gumla district. Loki has no road connection; Maoists stopped work on a road to the village about a year ago (see ‘Uneasy alliance’,). 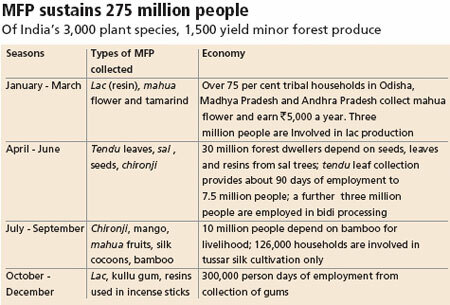 The MFP economy is fragile but supports close to 275 million people in rural India, according a World Bank estimate. These people comprise the poorest, including 54 million tribals. Agriculture takes care of their food while MFP is the main source of cash income. The Planning Commission has put the annual trade of MFP at Rs 50,000 crore, but MoEF claims the trade is worth less at Rs 5,000 crore. Very little of this money goes to forest communities. Take bamboo. It has about 1,500 documented uses. But communities do not have access to bamboo. Reason: the forest department treats it as timber; therefore, it cannot be felled. Madhya Pradesh, Chhattisgarh, Odisha, Andhra Pradesh and Maharashtra, which are among the worst Naxalite-affected states, account for 47 per cent of the total area under bamboo cultivation. The forest departments of these states together earn up to Rs 82 crore a year from bamboo. Despite FRA, which says bamboo is MFP, government, not people, continues to be the sole owner of the produce. A Supreme Court verdict of 2002 and arguments that bamboo is a grass, not tree, have not changed the forest department’s thinking. “The dispute over bamboo should cease now.FRA clearly defines it as an MFP,” said B D Sharma, former SC and ST commissioner with the Central government. States do grant certain customary rights to tribals over bamboo. For example, people living near forests in Andhra and Karnataka are given bamboo free for personal use, but they are not allowed to sell. “Bamboo has a short growth cycle of four years which makes it renewable. 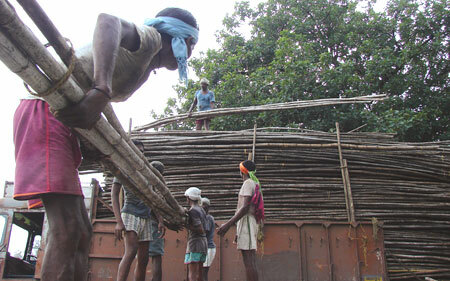 There should be bamboo cooperatives for tribals,” said Sharma. With the Supreme Court ban on tree felling without working plans, bamboo has become a major source of revenue for forest departments. “Plantation in private land can help, but there are many tribals and poor artisans who do not own land. The first step to ensure right to livelihood of tribals would be to deregulate restrictive laws,” said Ashok Mashram of Mahatma Gandhi Adivasi Seva Kendra, an NGO in Balaghat district of Madhya Pradesh. Tendu leaf collection and sale is another major source of profit for forest departments. It is a well organized trade in Odisha, Madhya Pradesh, Andhra Pradesh, Chhattisgarh, Jharkhand and Maharashtra. It is lucrative, so these states have nationalised tendu leaf. “We calculated that in Odisha the income of one million registered tendu leaf collectors is Rs 64 crore, while the profit the state makes is Rs 500 crore,” said Bibhuti Bhushan Pradhan of nonprofit Vasundhara in Bhubaneswar. In Shankarpur village in Maharashtra’s Gadchiroli district, residents expressed resentment over the measly payments they receive. 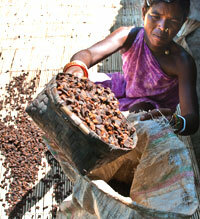 “Our village produces 150,000 to 200,000 packets (70 leaves each) of tendu leaves every year. The government contractors give us Rs 100 to Rs 105 for 100 packets,” said Falgun Talmale, a member of the village forest rights committee. This is twenty times less than the market price of Rs 200 to Rs 250 per kg (five to 10 packets). Tendu leaf collectors work the hardest, but it is the contractors and the forest departments that make the profits, said Shivram Budhe, a resident. In Madhya Pradesh, the state earns over Rs 200 crore from tendu leaf sale but wage paid to collectors is less than half of it. The authorities say they return all profits to the collectors and retain only establishment costs. But the tribals say there is no surety whether they would receive the bonus. In the four districts of the Bastar region of Chhattisgarh, a major tendu leaf collection centre, the state earned Rs 25.7 crore from tendu sales this year of which only Rs 13.2 crore was the wages due to the collectors. Till the collectors are assured of good income, people like Laxman Nag of Kolang village will continue to have nightmares of bird attacks.